POMONA – After two days of competition at the Lucas Oil NHRA Winternationals only a small portion of the 320 sportsman competitors remain in competition. The remaining competitors will have a busy day on Saturday if they intend to reach the Big Show on Sunday. Saturday’s schedule includes several rounds for each class as they race down to the semifinal rounds. After 3 rounds of qualifying Florida competitor Ed Ferderkeil Jr. lead the 14-car field in his ’12 Avenger with a stellar -.714 under 6.906 lap. Ryan Warter qualified second with -.686 under 8.594 in his ’92 Camaro and Tom Mettler rounded out the top 3 with a -.677 under 7.293 in his ’01 Dakota. Team DragChamp pick Doug Lambeck was 6th on the charts with a -.629 under 8.311 in his ’08 Sunfire. Click here to ride along with Ryan Warter on his Q2 lap. Comp racers will move into eliminations on Saturday. Cody Lane earned the #1 qualifier honors in his beautiful SS/BS ’05 Cavalier with a -1.183 under 8.467 lap. After two rounds of eliminations a number of talented drivers remain in competition including world champ Justin Lamb, Cody Lane, Jody Lang, Kyle Rizzoli, Ryan McClanahan, and Mike Cotten. The most intriguing match up in round 3 is Cody Lane against Jody Lang. Justin Lamb has the scheduled bye-run in round 3. Team DragChamp is 2 for 3 so far as Lamb and Lang are still in while Jimmy DeFrank fell in round 2. Leroy Duran drove his U/SA ’76 Mustang to the #1 qualifying position with a -1.227 under 13.623 lap. After two rounds of eliminations several top-tier racers remain in competition including Dan Fletcher, Leo Glasbrener, Al Corda, Jody Lang, Cody Lane, and more. Al Corda versus Jody Lang will be the match up to watch in round three. Like Super Stock, Team DragChamp is 2 for 3 so far as Fletcher and Glasbrener are still in while Ryan Mangus fell early. The Torres family is the story in Super Comp as Val, Val Jr. and Gabriel all remain in competition after two rounds. The problem is they are all on the same side of the ladder which means they may meet up soon if they can turn on more win lights. The blessing is there’s a great possibility that one of the family members ends up in the final round. After dominating Super Stock and Stock the last two seasons, Justin Lamb jumped into Super Comp this weekend. Justin continues to prove he is one of the most talented and versatile sportsman drivers in the country. He’ll face Kevin Wright in round three. Team DragChamp is 1 for 3 as only Val Torres Jr. remains in competition. Marko Perivolaris fell in round two while Ryan “High Gear” Herem fell in round one. After two rounds of competition, a number of talented racers are still looking to hoist the Wally on Sunday afternoon. Brad Pierce, 2018 event winner Kevin McClelland, Greg Ventura, Mike Wiblishouser, and Ed Oplin lead the field into round three on Saturday. Team DragChamp didn’t fair so well in Super Gas. Kevin McClelland is the only pick to make it through the first two rounds. 2018 Super Comp world champ Steve Williams and two-time 2018 national event winner Matt Blodgett both fell early. Phil Dion paced the Top Sportsman field with a 6.34, 227.08 lap in his ’17 Corvette. Dion was followed by Phil Unruh’s 6.431, 227.27 pass in his ’18 Corvette. 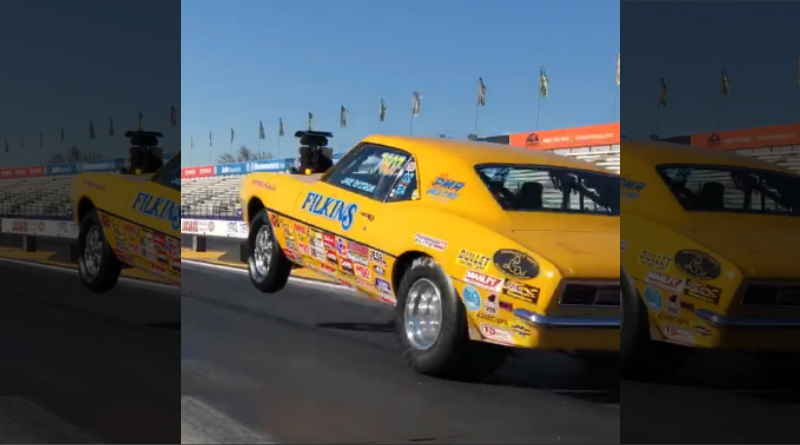 Both Team DragChamp picks, Mike Ferderer and Ed Olpin, found win lights in round one. Other notable first round winners include 2018 #3 in the world Doug Crumlich, Phil Unruh, Wayne Newman, and Rick Okerman. Bobby Ray Mahan lead the Top Dragster field in qualifying with a 6.120, 226.92 lap in his dragster. Mahan just edged out number two qualifier Kevin Brannon’s 6.131, 225.48 effort. The story of the event occurred in round one when Brian Fitzpatrick posted a 5.841, 241.11 lap in his Toyota powered dragster. Yes, you read that right, 5.841 with Toyota power! Fitzpatrick’s amazing run earned him a DQ from the event but I’m pretty sure he doesn’t care as that was an amazing lap. Click here to watch the run. Team DragChamp pick Steve Casner did not make a qualifying attempt but Phil Unruh did make it past the first round. That’s a wrap on Day 2. Check back tomorrow for Day 3 results. Click here to read the event preview.